1. No more advanced find – use the Outlook client select a record say Accounts and then click the View ribbon. From here select the add columns button and scroll to the bottom of the list to the user defined fields and select. Now you can add CRM fields to your view and from there apply simple or more complex filters. 4.Calendar Preview – how many of you use preview on the calendar? Well by using the preview on the calendar enables you to select an appointment and quickly navigate to the tracked CRM record, saving clicks. 5. 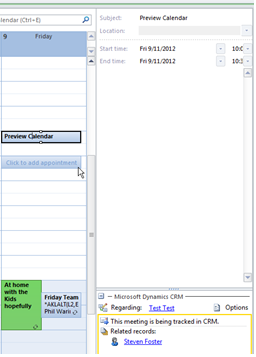 Conditional formatting in Outlook, use the outlook feature on CRM records and highlight records that need action. To save the formatting for next time start from a system view, apply the formatting and then save as a new view, the conditional formatting will now stick. 6. You may know about quick access to previous records in the browser but do you know you can do it in Outlook as well? Right click on an Outlook CRM folder and then select Recent records, a very cool productivity tip. 7. Track records by selecting Set Regarding only, if you are not setting the regarding to something then what is the purpose of tracking it? 9. In the browser you navigate to a view open the first record and then use the up and down arrows to navigate between the records or select the dropdown to arrow and click the record you want to view. 10. Quickly populate date fields by just typing the day and month and tabbing out of the field, the year will default. 11. Use charts to sum or count records in views rather than exporting to Excel. I hope those made your day and you learnt a cool new tip to help reduce clicks and increase productivity.